Quaker Samplings [C5920] - $13.00 : Yarn Tree, Your wholesale source for cross stitch supplies. Cross stitch pattern by With My Needle. 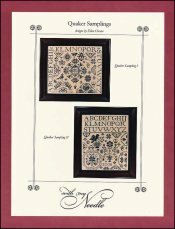 "Quaker Samplings," features two medallion samplers. "Quaker Sampling 1" features the alphabet stitched around the outer edge as a border. Inside the border, are motifs, chirping birds, small acorns, loving hearts & royal crowns. "Quaker Sampling 2" features the alphabet stitched at the top with motifs, chirping birds, small acorns & royal crowns stitched below. After stitching these designs, stand back & enjoy the beautiful & distinctive pieces you have just created. Stitch counts: Quaker Sampling 1 is 157W x 134H & Quaker Sampling 2 is 134W x 161H.